Sense International supports the development of services for deaf and/or blind children throughout India. This organization supports community-based vocational and teacher training projects for the deaf and blind, lobbies the government on deaf/blind issues, and publishes awareness materials related to deafness/blindness. The SHARE Institute awarded Sense International a mini-grant which was used to develop and distribute 1,000 copies of information on issues related to the stigma of blindness and deafness in India. 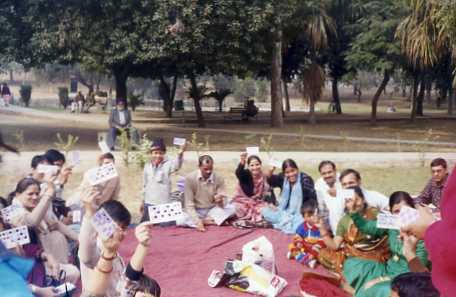 The SHARE Institute donated a mini-grant to Sense International which was used to sponsor a Family Fun Day in Delhi’s Nehru Park for blind-deaf children and their families. The main purpose of this day was for the deaf-blind children to get together with their parents, teachers, siblings and other family members to enjoy a day in an open park. During the day, many activities took place to display strong parent-teacher relationship vital to the progress of the children in this program. The SHARE Institute donated a mini-grant to Sense International to support a program to educate parents and their deaf/blind children in the community to emphasize the importance of family involvement in the education of their children.